Today, I set out to do what I thought would be a simple and relatively quick task. As an aside, have you ever noticed that the “quick and easy” tasks seem to take the most time? Anyway, I have an old Dell workstation with dual Intel Xeon E5520’s and 36GB of RAM that runs VMware. I use for testing and labbing. It’s currently running VMware 5.1 and my evaluation has expired. For a long time… It’s always bugging me about that and I can’t switch it to the free ESXi because it has more than 32GB of RAM. That limitation was removed with VMware 5.5, so I’m finally getting around to upgrading this machine. 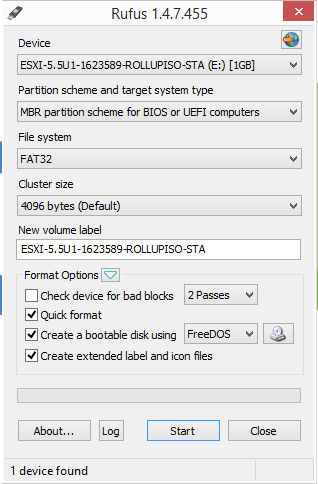 I really wanted to install off USB and skip the optical drive, so I grabbed a 1GB USB drive that VMware gave me years ago (conveniently already labelled “VMware”) and copied the files from the ISO to it. Yeah, not good enough. So I formatted the USB and tried to write an MBR to it. On my Mac. Running Mavericks (OSX 10.9). Well, that’s inconvenient. The I went on to try UNetbootin, which normally has been reliable, but not this time. Still no booting. Rebooting this machine repeatedly to see if this USB boot is starting to get annoying. 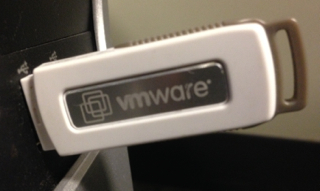 Click the little disc icon near “Create a bootable disk using”, choose your VMware ISO image, and you’re off and running. You might get a prompt regarding your “menu.c32” being out of date. Let it update it and then it will create your bootable USB. Next time, I’ll start with Rufus!